This map shows the ground track for UARS beginning in the Indian Ocean off the coast of Africa at 0330 GMT and ending at atmospheric interface over the Pacific Ocean at 0401 GMT. In this map, UARS' path is shown beginning in the Indian Ocean off the coast of Africa at 0330 GMT and ending at atmospheric interface over the Pacific Ocean at 0401 GMT. NASA and the military have pinned down exactly where and when a huge dead climate satellite fell to Earth on Saturday (Sept. 24). 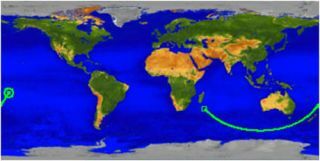 The defunct Upper Atmospheric Research Satellite (UARS) re-entered the atmosphere at 12:01 a.m. EDT (0401 GMT) on Saturday, falling into the Pacific at 14.1 degrees south latitude and 189.8 degrees east longitude (170.2 west longitude), according to the Joint Space Operations Center at Vandenberg Air Force Base in California. NASA announced the new details today (Sept. 27). "Six years after the end of its productive scientific life, UARS broke into pieces during re-entry, and most of it up burned in the atmosphere," NASA wrote in a final status update. "Twenty-six satellite components, weighing a total of about 1,200 pounds, could have survived the fiery re-entry and reach the surface of Earth." UARS' final entry point places it in a "broad, remote ocean area in the Southern Hemisphere, far from any major land mass," according to the NASA statement. UARS debris could have scattered between 300 miles and 800 miles downrange, or generally northeast of the re-entry point. "NASA is not aware of any possible debris sightings from this geographic area," officials wrote. Just after the UARS spacecraft's plunge into the Pacific, NASA officials said it was likely the satellite was at the bottom of the ocean, but the exact location and time of its re-entry might never be known. But today, NASA announced that it had identified the satellite's re-entry point. NASA originally announced that UARS would fall back to Earth in an "uncontrolled re-entry" in late September or early October, and later refined the prediction down to the day. But no one could predict ahead of time exactly where or when the spacecraft would fall, because its trajectory depended on radiation from the sun and other varying conditions. Even after the satellite came down, NASA could merely confirm that it had re-entered, most likely within 20 minutes of 12:16 a.m. EDT (0416 GMT), and probably over the Pacific Ocean. "We extend our appreciation to the Joint Space Operations Center for monitoring UARS not only this past week but also throughout its entire 20 years on orbit," Nick Johnson, NASA's chief scientist for orbital debris, at NASA's Johnson Space Center in Houston, said in a statement. "This was not an easy re-entry to predict because of the natural forces acting on the satellite as its orbit decayed. Space-faring nations around the world also were monitoring the satellite’s descent in the last two hours and all the predictions were well within the range estimated by JSpOC."